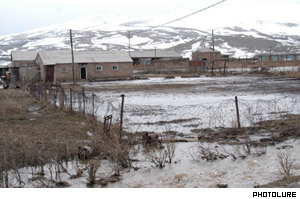 The government allocated on Thursday 507 million drams ($900,000) in preliminary urgent assistance to residents of the mainly rural areas across Armenia hit hard by last week's spring floods which officials described as the worst in decades. Up to now, we have made only small profits from sales, Aramo says. Just when I was about to understand my life in Armenia . . . Well, help me out here. The State Committee on Refugees and Migration of Armenia and the Swiss Field Office on Refugees have started (on March 1) a trial program for encouraging illegal emigrants to return and stay in Armenia. According to statistics, some 800,000 to 1 million citizens have left Armenia since independence. The majority have entered and stayed in countries illegally. Armenia's new human rights ombudsman, Larisa Alaverdyan, who took up her post beginning this month, is already defending herself against fierce criticism that she is a mere servant of the president. "The institution of human rights must not only provide defense in specific cases or for specific problems, but it should also have a preventative role," Alaverdyan told IWPR in an interview. Surrounded by noisy conversation, dirt, old and new shoes and the miscellany of a busy city street, spring greens and fruit find their place on the ground one next to the other. A short distance away there is pickled food open for dust and for consumers and in the front there are bakery products in the same uninviting environment. Nearby a man with questionably clean hands and dishes invites everyone to have sausage and khorovats (barbecue). Ten chess players from Armenia, Russia, Switzerland, Poland, Latvia and Iran are participating in the Tigran Petrosyan 75 th Anniversary Memorial Tournament taking place in Stepanakert, Karabakh. The tournament began March 8 and will finish March 18. It is the first international sporting event organized in Nagorno-Karabakh Republic. The matches are played at the Officers' Club Auditorium in Stepanakert. In anticipation of this weekend's visit by Georgian President Mikhail Saakashvili, workers put up flags on Mashtots Avenue in Yerevan. At first, Armenian and Georgian flags were placed, but the Georgian ones had to come down when it was discovered that the design was wrong.